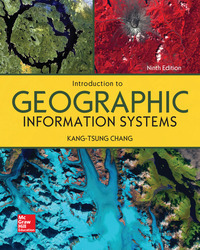 Introduction to Geographic Information Systems, 9th edition is designed to provide students in a first or second GIS course with a solid foundation in both GIS concepts and the use of GIS. Introduction to GIS strikes a careful balance between GIS concepts and hands-on applications. The main portion of the chapter presents GIS terms and concepts and helps students learn how each one fits into a complete GIS system.